Lowdown: Big companies are doing lots of nasty things to the people of Africa, right under the nose of our naive and not so heroic hero, Ralph Fiennes. I really like Ralph Fiennes: I think he's one of the best actors around. I don't really like John Le Carre, on whose book The Constant Gardener is based: I find his books way too slow and boring for me to enjoy, even if on paper their topics should be of interest. 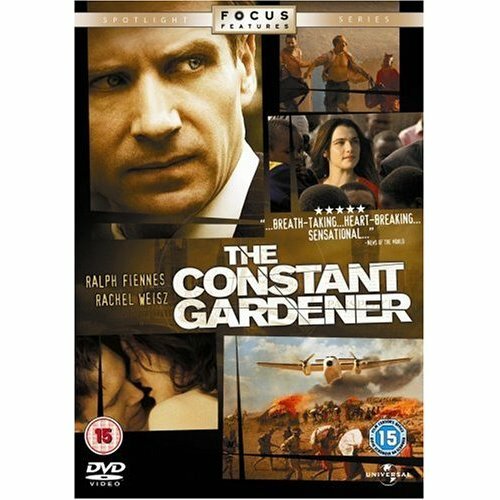 I have found The Constant Gardener, a film based on a Le Carre book which I didn't read, to match the normal patterns of a Le Carre book: it is slow, you don't know much but you struggle through to learn stuff little by little, and it discusses topics that are interesting. I do have to say that overall it seems the Fiennes side of the equation won: I liked constant gardening and I think the film is quite good. The story follows Ralph Fiennes, a British civil servant who, by his own account, is not the best of the lot. While giving a lecture on behalf of someone else, in a rather boring way, he is interrupted by a rather impolite Rachel Weisz, who questions him about the UK's involvement in Iraq. While the rest of the lecture's crowd scorns her - even though she is asking the questions they should all be asking - Fiennes actually gets attached to her. Time passes by and Fiennes is sent to be a British representative in Africa; the socially active Weisz wants to tag along for her own private social agenda, so they get married. The film's plot development is not linear, choosing to be flashback based - an approach which, generally speaking, I am not a big fan of. The film actually starts with us learning that Weisz has been murdered, rather brutally, in some remote place in Africa. This drives Fiennes, who up until then only cared about his garden, to look around and investigate what really happened: Did she have an affair? What was she doing there in the first place? His private investigations turn out to be less than popular with the rest of his British friends. He learns things he was not meant to learn. He finds out that pharmaceutical companies have been using the people of Africa to test and approve drugs that were obviously not ready to be used on humans. And more importantly, through his investigative journey, he finds his own conscious. For people who don't know much about what happens in Africa, probably the vast majority of "us" westerners, the film could and should be a fine lesson on how - by indulging ourselves with selfish consumerism - we have forgotten how others, who are not as fortunate as we are, and who are paying the price for our comfortable living. According to the film, the biggest criminals out there are private companies, but governments are not that far behind; and who are these governments if not our own, democratically elected, representatives? The film goes on to show that each one of us - the individuals - can and should make a difference to the lives of the people of Africa, a point which made the news lately through the stupid amount of coverage the story of Madonna's African adoption has received. According to The Constant Gardener's director, we should stop messing about with Madonna and point our sights instead at the poor people of Africa, who we all crime by exploiting and ignoring them. Weisz got herself an Oscar for this film; I don't know why, exactly, as I didn't really find her performance to be that powerful or captivating. 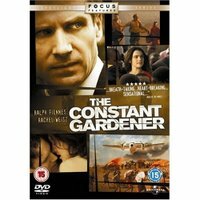 But regardless of that, The Constant Gardener is quite a powerful film, a film which would hopefully stick in enough people's heads the problems of the poorer people of this world as well as the problems of the richer people of this world. Best scene: Ralph Fiennes, who has previously refused to help an African youth and his young sister who just gave birth by driving them home and saving them from a 40 kilometer walk, realizes that he can make a difference. He asks to save a young African girl when a raid takes place in her village; but the only answer he receives is the answer he gave before when he himself refused to help: there are so many millions of them out there, what difference would one of them make? Well, if you ask Le Carre, quite a lot.